Tim Henman claimed his first victory over Andy Murray after a deserved 6-4 6-2 triumph in the first round of the Thailand Open in Bangkok. Henman, who had lost the three previous encounters with Murray, had a storming start and took a 5-2 opening set lead. But the fourth seed fought back to 5-4 only for Henman to take the set after winning a lengthy 10th game. 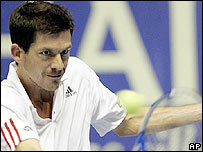 Two early breaks in the second set helped Henman seal victory and he now faces fellow Briton Alex Bogdanovic. Henman, who lost to Murray in Toronto and Cincinnati earlier this year and in Switzerland in 2005, was determined to stop the rot and produced an aggressive and determined display. "There is always a lot of focus on this game," Henman told BBC Five Live. "Overall I played some really good tennis, and I needed to with him having played as well as he has done recently. "I played better on crucial points this time, while the last time he beat me because he played better on those points. My serves were the key." "It's certainly a good win and I am really keen to build on that now." The former British number one, now ranked 59 in the world, used his chip and charge game to great effect and the pressure led to Murray making a series of unforced errors. Murray had put Henman's serve under pressure in the opening set with some deft returns but could not get close enough for a crucial break. And Henman had already broken twice before the decisive 10th game in the first set which saw the 32-year-old save five break points before taking the set with a drop shot. It took time for Murray to recover from the shock and he promptly lost the opening four games of the second as Henman continued to dominate. Murray, who seemed to feel the effects of helping Britain to a 3-2 Davis Cup win over Ukraine in Odessa last weekend, did get on the board by holding serve twice but Henman had little trouble in serving out the match. "It was really hard to get ready to play here, I wasn't tired, but it is such a change from Davis Cup play," said Murray. "Playing Tim is always big, I knew it would not be easy at all. I just couldn't play my best after 18 hours of travel." The 19-year-old, who lost to Roger Federer in the final last season, gained some consolation later on Wednesday when he and brother Jamie won their first round doubles match. They beat Frank Dancevic of Canada and America's Robby Ginepri 3-6 7-6 (7-5) 10-0.